The DMI shopping cart's compact size is perfect for picking up a few bags of groceries, books from the library or a load of laundry. This rolling cart is ideal if you walk or take public transportation to stores. It's also great for getting the groceries from the car to the house without straining your back. Lightweight and easy to fold, it fits nicely in the trunk of your car. Home Styles Cuisine Kitchen Cart in a black finish with a wood top features solid wood construction, and Utility drawer; 2 cabinet doors open to storage with adjustable shelf inside; Handy spice rack, Towel bar; Heavy duty locking rubber casters for easy mobility & safety. Size: 32.5w 18.75d 35.5h. Home Styles Create-a-cart in a cherry finish with a black granite top features solid wood construction, and 4-Utility drawers; 2 cabinet doors open to storage w/adjustable shelf inside; Handy spice rack with Towel bar; Paper Towel holder; Heavy duty locking rubber casters for easy mobility & safety. Size: 48w 17.75d 35.5h. Home Styles Create-a-cart in a cottage oak finish with a wood top features solid wood construction, and 4-Utility drawers; 2 cabinet doors open to storage w/adjustable shelf inside; Handy spice rack with Towel bar; Paper Towel holder; Heavy duty locking rubber casters for easy mobility & safety. Size: 48w 17.75d 35.5h. Home Styles Create-a-cart in a white finish with a black granite top features solid wood construction, and 4-Utility drawers; 2 cabinet doors open to storage w/adjustable shelf inside; Handy spice rack with Towel bar; Paper Towel holder; Heavy duty locking rubber casters for easy mobility & safety. Size: 48w 17.75d 35.5h. Folding Shopping Cart The DMI shopping cart's compact size is perfect for picking up a few bags of groceries, books from the library or a load of laundry. 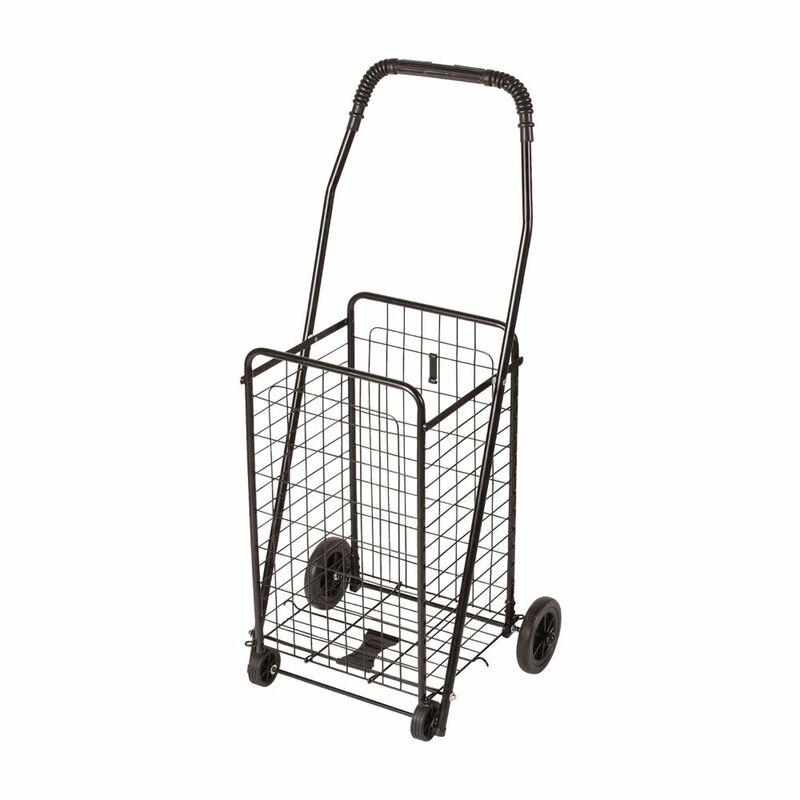 This rolling cart is ideal if you walk or take public transportation to stores. It's also great for getting the groceries from the car to the house without straining your back. Lightweight and easy to fold, it fits nicely in the trunk of your car. Folding Shopping Cart is rated 3.5 out of 5 by 20. Rated 4 out of 5 by lulu from A Christmas gift for a friend who can no longer drive. She is within walking distance of stores a... A Christmas gift for a friend who can no longer drive. She is within walking distance of stores and can just take the cart. She has used it already and is very pleased with it. Rated 5 out of 5 by Doris from I'm loving it.... I'm loving it. Rated 4 out of 5 by artsypoets from I wish we could have afforded more heavy duty carts,... I wish we could have afforded more heavy duty carts, but our neighbors seem to have this kind. It may be a two person assembly job. I did it alone, but it would be good to have someone hold the parts together during assembly. Hopefully, they will hold up when walking several miles. Rated 2 out of 5 by Patricia from It was not the right size so I returned it... It was not the right size so I returned it in store. I found it difficult to find dimensions online. Pictures of cart with an identifiable object, such as a standard bag of groceries might give customers a better idea of cart size and lessen returns. Rated 5 out of 5 by Pookle from Replaced another that I accidently damaged. Had the "old" one... Replaced another that I accidently damaged. Had the "old" one for years and intend to keep this one "forever"! Fits in car well and is very easy to use to handle heavy grocery bags.Love it! Rated 1 out of 5 by JD from Item was received 7\12 and on 7\13 one of the wheels came of while being used! I am very disappoi... Item was received 7\12 and on 7\13 one of the wheels came of while being used! I am very disappointed with this shopping cart,I purchased it for a senior that needed it desperately and she still has to get another one!! !